We’d love your help. Let us know what’s wrong with this preview of Mulled Murder by Kate Kingsbury. To ask other readers questions about Mulled Murder, please sign up. I almost made it through the year with only 1 book that I couldn't finish...then I picked up this one. It's our book club book so I didn't bother to look it up. I didn't know it was a historical mystery until after starting it. I'm not a huge fan of them anymore, but I do still read them. With this one, however, I couldn't finish it. The main characters (or the ones that I was introduced to) were annoying. She purposely tried to hide evidence from the constable?? Also, I couldn't grasp the wordi I almost made it through the year with only 1 book that I couldn't finish...then I picked up this one. It's our book club book so I didn't bother to look it up. I didn't know it was a historical mystery until after starting it. I'm not a huge fan of them anymore, but I do still read them. With this one, however, I couldn't finish it. The main characters (or the ones that I was introduced to) were annoying. She purposely tried to hide evidence from the constable?? Also, I couldn't grasp the wording that was used. It got on my nerves! Maybe I would've enjoyed it more had I started with the first book in the series (and not the last!! ), but who knows. After more than two decades of entertaining readers around the globe with her Pennyfoot Hotel Mystery series comprising of twenty-one books, including nine Christmas editions counting her latest book in the series Mulled Murder, bestselling author Kate Kingsbury has decided to call it a day on this long-running series and in a fitting finale to this thrilling saga writes a book that fans will remember for a long time to come. Mulled Murder brings Cecily and Baxter close together again, as they wo After more than two decades of entertaining readers around the globe with her Pennyfoot Hotel Mystery series comprising of twenty-one books, including nine Christmas editions counting her latest book in the series Mulled Murder, bestselling author Kate Kingsbury has decided to call it a day on this long-running series and in a fitting finale to this thrilling saga writes a book that fans will remember for a long time to come. Mulled Murder brings Cecily and Baxter close together again, as they work together to find a killer lurking in the secret tunnel below the Pennyfoot Hotel. It is a mystery waiting to be read. The first Pennyfoot Hotel Mystery book Room with a Clue containing 204 pages was published October 1st 1993 by Berkley. And the final installment in the series Mulled Murder containing 304 pages has been brought out by the same publisher Berkley on October 29, 2013. The series lasted 7333 days which is exactly 20 years and four weeks. It is one of the longest running series not only in terms of years but also in terms of books. Murder strikes again close to home as holiday season draws near at Pennyfoot. It's bad enough that Cecily Sinclair Baxter has to deal with loosing one of her housemaids as she is leaving to get married, but the new additions and guests at Pennyfoot leave her plenty to be curious about. When the first dead body turns up a little too close to the country club, there is talks once again that Pennyfoot might be cursed. The last thing Cecily wants is for this to be revealed to everyone else with Chri Murder strikes again close to home as holiday season draws near at Pennyfoot. It's bad enough that Cecily Sinclair Baxter has to deal with loosing one of her housemaids as she is leaving to get married, but the new additions and guests at Pennyfoot leave her plenty to be curious about. When the first dead body turns up a little too close to the country club, there is talks once again that Pennyfoot might be cursed. The last thing Cecily wants is for this to be revealed to everyone else with Christmas around the corner. I picked this one up hoping to get my Christmas reading fix. I know, I know, it's not even Thanksgiving yet and I am already craving all those warm holiday stories. I have to say, this did not deliver as much as I wanted it to. Christmas, or holiday season was mentioned in passing. There was a lot going on in this book, not only with murder, but with guests and the downstairs staff, and upstairs. I felt the story branched out a couple of times and although it was easy to follow, everything just out of no where fell together in the last few chapters of the book. Things that I wouldn't have found related, just suddenly where related. The murder I felt also took kind of a back seat in this one as well. Most of the focus seemed to be on Pansy, Lilly and the new girl Alice. Although Cecily was investigating the murder, she only appeared ever so often and sometimes left me in question how she entered the conclusion about what's going on, cause it left me scratching my head with the lack of investigating going on. I did like the book, the characters were interesting, the writing was very nice. Kingsbury can tell a story well. I was a bit disappointed about how the murder and the wedding where also mentioned in passing in the end, but it was still a pleasant read! Recommends it for: those who enjoy this series. Mulled Murder by Kate Kingsbury will be the last book she will write in this series. At the beginning of this book, the author told the readers In Acknowledgments, Ms. Kingsbury states "I'm sad to say that this book will be the last in the Pennyfoot Hotel Mysteries. Most of the characters are looking forward to new lives, and it's time to let them go." Having just discovered this series, I will have lots of other books in the series to read so I'm not sad that this is happening, but I am sure th Mulled Murder by Kate Kingsbury will be the last book she will write in this series. At the beginning of this book, the author told the readers In Acknowledgments, Ms. Kingsbury states "I'm sad to say that this book will be the last in the Pennyfoot Hotel Mysteries. Most of the characters are looking forward to new lives, and it's time to let them go." Having just discovered this series, I will have lots of other books in the series to read so I'm not sad that this is happening, but I am sure that the author will miss her characters who live in Badgers End in southeast England. Mulled Murder, a holiday cozy mystery, is fun, but I feel that the author put too many problems/small mysteries into the major mystery. It almost became confusing keeping track of everything and everyone. Possibly Ms. Kingsbury is trying to let the characters, old and new, say 'good-bye." Luckily for the readers, the author is going to continue to write. Thus, good-bye citizens of Badgers End. Good luck and be happy!! I am sighing, deeply, to do this review. I am so sorry that this will be the last Pennyfoot book. I read all of the Christmas books in the series in the month of December, back to back. I drew close to the characters, enjoying their accomplishments, their happiness and on the flip side was saddened when they faced struggles, and hurts. I really loved these books and am just so sorry this is it. Finally those who were separated have come together, those in love are now side by side. Thank you Kate I am sighing, deeply, to do this review. I am so sorry that this will be the last Pennyfoot book. I read all of the Christmas books in the series in the month of December, back to back. I drew close to the characters, enjoying their accomplishments, their happiness and on the flip side was saddened when they faced struggles, and hurts. I really loved these books and am just so sorry this is it. I am so sad to be at the end of this series. I have been reading one of these Christmas at the Pennyfoot books every year and it has become a part of my holiday traditions. The setting is so cozy and I love the fact that it takes place in such a interesting time in the past. Things like motorcars are new all the rage (though some people are still wary). These characters are ingrained in my heart and I will always think about them around Christmastime. I think this was a good series wrap-up book. I am so sad to be at the end of this series. I have been reading one of these Christmas at the Pennyfoot books every year and it has become a part of my holiday traditions. The setting is so cozy and I love the fact that it takes place in such a interesting time in the past. Things like motorcars are new all the rage (though some people are still wary). These characters are ingrained in my heart and I will always think about them around Christmastime. I think this was a good series wrap-up book. The happiness that was shared throughout the book made me smile (Pansy's wedding excitement made me feel full of love). I was so surprised when Baxter offered to help Cecily in her snooping and (view spoiler)[ his act of trying to keep her out of danger by going into the frey himself hit me in the heart. (hide spoiler)] Their relationship has come such a long way since the start and I have loved following it. Though the murder and mystery itself seemed very simple to me, it might just be from the experience of this series. I still think it was neatly laid out and I loved following Cecily along the way as she did her snooping. I am always terribly (view spoiler)[ suspicious of any "new comer" to the Pennyfoot and I think that lead me to be suspicious of Bernie, Alice, Henry, and Jacob. When we learned all their secrets I wasn't as surprised as I might have been without this initial suspicion. (hide spoiler)] I think a huge part of the reason why I was able to guess the story line is the way that Kate Kingsbury is always true to her story and her characters. Her descriptions of people especially allow them to come alive so easily for me. The Pennyfoot and the characters are the reason I'm always coming back. I do wish we saw more of Phoebe and Madeline in this novel. I feel like we did not get any closure with them and they were barely present other than their "standard" roles in the series. It is Christmas time at the Pennyfoot Country Club and Cecily Sinclair Baxter is looking forward to her favorite things about the holidays - her friend Madeline's exquisite decorations, the caroling, Phoebe Carter-Holmes Fortescue’s pageants (even if they usually end disastrously). One tradition she wouldn't mind not happening is the murder mystery that seems to happen each year. Alas, she won't get her wish as a body is found washed up on the shores near the Pennyfoot - and the death was no acc It is Christmas time at the Pennyfoot Country Club and Cecily Sinclair Baxter is looking forward to her favorite things about the holidays - her friend Madeline's exquisite decorations, the caroling, Phoebe Carter-Holmes Fortescue’s pageants (even if they usually end disastrously). One tradition she wouldn't mind not happening is the murder mystery that seems to happen each year. Alas, she won't get her wish as a body is found washed up on the shores near the Pennyfoot - and the death was no accident. Cecily is once again caught up in trying to solve a murder but will her actions put those closest to her in danger? 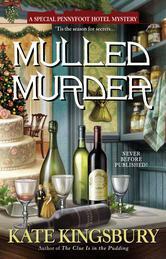 “Mulled Murder” is a fitting ending to a long-running cozy mystery series that will be missed. Last one in the Pennyfoot series. The author trys to connect all the dots with her characters as she closes the series out. I didn't feel this last one was as good as her others so maybe good it's over. But the book has some humor and okay to read, just rather so so. I didn’t realize that cozy mysteries could also be historical ones so I was surprised when I started this one. But I caught on quickly & realized it’s Edwardian England era. I thought that was a nice spin on the typical cozy story. Since this is the first one in this series I wasn’t lost in a sea of people. I was able to remember & understand who everyone was. Also, I thought it was written in a simplified style. (i.e. not a lot of historical factual detail taking up pages of descriptions) I didn’t realize that cozy mysteries could also be historical ones so I was surprised when I started this one. But I caught on quickly & realized it’s Edwardian England era. Also, I thought it was written in a simplified style. (i.e. not a lot of historical factual detail taking up pages of descriptions) I was able to figure out what the time period was. For example, it opens with the dead body, introduces the regular characters, introduces the suspicious clues and then the story moves along quickly. Did Cecily own a hotel & live there w/her husband? And now the hotel was a country club? If so, what’s the difference? but i will say b/c it was simple, i did figure things out quickly. ah well. it's sometimes fun to feel like a super smart sherlock holmes when you get to the end & can say " Aha! I knew it!" I enjoyed reading this book as I have others in the series. Unfortunately, I found out that this will be the last one of this series. So now I want to check and see if I missed any of the others. Fun murder mystery set in England about a hundred years ago, I'm guessing. Not a big fan of this series. Occasional reads are about all I can do. Mulled Murder by Kate Kingsbury is a Christmas themed cozy mystery set in England in the Edwardian era. It is the last of the Pennyfoot hotel mystery series, although you do not need to have read any of the previous books to enjoy this. I bought this having no idea it was part of a series, and it was no big deal. The story starts off with a body washed up on a beach outside the Pennyfoot hotel. It turns out that murders and mystery are no stranger to Cecily Baxter, the owner of the hotel. The hotel is known for having strange going on, especially at Christmastime, no doubt a reference to earlier novels in the series. The body turns out to be a guest of the hotel, and when it is discovered later that he was a private detective working on a case, the plot deepens. There’s a lot going on at the Pennyfoot hotel this season, including a wedding for one of the housemaids, a theater production on Christmas Eve and new staff to train. To make matters worse, the plumbing goes out- but the new plumber seems more interested in the housemaids than in getting the lavatories back in operation. Cecily soon discovers that the murder and some of her staffing issues may be related. A young woman is found one morning in the courtyard, half conscious and with no memory of who she is or where she comes from. Cecily takes her in and tries to keep everything together long enough to get through the holidays, but soon finds that something nefarious is happening at the Pennyfoot... or perhaps under the hotel, in the tunnels beneath the wine cellar. I likd this story well enough, however it didn’t grab me and demand to be read, so I did drift away from it a couple of times. The perspective shifts between Cecily and various of the help staff- Pansy (the maid getting married) and Gertie (the chief housemaid) primarily. Several of the supporting characters were fun and interesting- Mrs. Chubb the cook reminded me of Mrs. Patmore from Downton Abbey, although that may mean I’ve just been watching too much of that show! Madeline, the mysterious woman who may be a witch, and occasionally has premonitions she shares with Cecily, could have been utilized more perhaps- I suspect she may have played a role in earlier installments. It’s Christmastime at the Pennyfoot Country Club and there are many preparations remaining. Cecily Sinclair Baxter is excited for the upcoming holidays but starting to get nervous that not everything will be done in time. The hotel is short-staffed and Cecily also agreed to host one of the housemaid’s wedding. Things get even worse when one of the Pennyfoot’s guests is found murdered on the beach and it’s up to Cecily to solve the crime before her nemesis Inspector Cranshaw arrives and ruins Pan It’s Christmastime at the Pennyfoot Country Club and there are many preparations remaining. Cecily Sinclair Baxter is excited for the upcoming holidays but starting to get nervous that not everything will be done in time. The hotel is short-staffed and Cecily also agreed to host one of the housemaid’s wedding. Things get even worse when one of the Pennyfoot’s guests is found murdered on the beach and it’s up to Cecily to solve the crime before her nemesis Inspector Cranshaw arrives and ruins Pansy’s wedding, along with the hotel’s other Christmas plans. "Mulled Murder" is an enjoyable holiday mystery and from the author’s note at the beginning of the book, it appears it will be the final book in the series. It wouldn’t be a Pennyfoot Holiday mystery without Cecily scrambling to get ready for Christmas while trying to solve a murder. As usual, Cecily’s friend Madeline is on hand to decorate the hotel and the sometimes overbearing Phoebe is planning a grand pantomime. What’s different in this book is Cecily’s husband Baxter instead of forbidding her to get involved in the murder investigation actually wants to help her. This is the first time in a long time of reading these books that I liked Baxter and could understand what Cecily saw in him. His partnership with Cecily in the investigation added to it and gave the story a fresh feel. As much as I have always liked Cecily and Madeline, the real stars of this book and of the series are the household staff. The rapport between the cook Mrs. Chubb, housemaids Pansy and Gertie, and temperamental chef Michel are priceless – full of both humorous as well as touching moments. I love these characters, and seeing them interact on the job and in their personal lives are my favorite parts of the book. Gertie and Pansy both have some great moments in this book, so long-time readers won’t be disappointed. New readers could catch up and enjoy the story, but since this is the last book in the series, it would be better to read some of the prior books that build up to the events that take place in "Mulled Murder". The only downside of the book is a bit too much happens which the reader only hears about after the fact. It’s disappointing that after a build-up throughout the book, the reader doesn’t get the payoff of getting to see some of the events unfold. There also seems to be an over-abundance of smarmy men this time around which becomes creepy, but unfortunately doesn’t add anything to the murder investigation. Overall, "Mulled Murder" is a fun, holiday cozy. I will miss these books and especially the characters of Cecily, Gertie, and Pansy, but I’m happy that author Kate Kingsbury does the characters proud when wrapping up this delightful series. It's Christmas time at country club Pennyfoot. There's a Christmas Eve wedding, caroling in the library, and an annual production put on by owner Cecily's friend. Needless it say it's a busy and slightly chaotic time of year for this hotel! When the body of a guest washes up on shore, Cecily knows this will just add to the craziness. The man was stabbed and the name he checked in under wasn't his real name. The detective is more interested in leaving for holidays than investigating, which leaves It's Christmas time at country club Pennyfoot. There's a Christmas Eve wedding, caroling in the library, and an annual production put on by owner Cecily's friend. Needless it say it's a busy and slightly chaotic time of year for this hotel! When the body of a guest washes up on shore, Cecily knows this will just add to the craziness. The man was stabbed and the name he checked in under wasn't his real name. The detective is more interested in leaving for holidays than investigating, which leaves Cecily to investigate herself. When a young girl appears on her grounds with no memory of who she is, Cecily puts her to work and wonders if there's any connection to the other crime. Cecily is a woman before her time. I didn’t really think there were many women proprietors in the pre-WW1 era, but here she is. As unlikely as it may seem, she seems to be doing quite a fine job of running the Pennyfoot. She’s a smart woman with an unfortunate knack for finding dead bodies. And just when you think Christmas will go by with nothing unusual happening, dead bodies, flooded bathrooms and giant rats all start appearing. This mystery really becomes two mysteries in one because we real Cecily is a woman before her time. I didn’t really think there were many women proprietors in the pre-WW1 era, but here she is. As unlikely as it may seem, she seems to be doing quite a fine job of running the Pennyfoot. She’s a smart woman with an unfortunate knack for finding dead bodies. And just when you think Christmas will go by with nothing unusual happening, dead bodies, flooded bathrooms and giant rats all start appearing. This mystery really becomes two mysteries in one because we realize that in order to solve one mystery, we have to solve the other one first. I found this story to have the right amount of mystery and suspense, but not all of the gore that I do not enjoy. It kept me guessing, until the very end. I appreciated the fact that she didn’t throw a lot of red herrings around. It made the story more enjoyable because the clues really were clues you could use. I thought Kate Kingsbury gives us an excellent look at what life was like in this era. And running a hotel without all the modern conveniences we have today—very impressive. The only drawback to the story was the fact that it’s the 9th book in the series. While it mostly stands alone, there were too many past relationships and questions that went unanswered for me. The book is still a good and solid read, but I felt there were some areas that could have been written just slightly differently that would have made it so much easier for me and other new readers to the series to catch up quickly. Overall, a gem of a mystery that will keep you guessing. Mulled Murder is the twenty-first book in the Pennyfoot Hotel series. And to say, for me at least, this is the last book in the series. Once again the rush is on around the Pennyfoot Country Club to get ready for the Christmas celebration. Phoebe is once again in a dither putting together yet another skit to present at the annual Christmas show. In addition, Phoebe and her husband, Col. Fortescue find the body of Gerald Evans on the beach near the hotel. They soon fined that he was in fact a gues Mulled Murder is the twenty-first book in the Pennyfoot Hotel series. And to say, for me at least, this is the last book in the series. Once again the rush is on around the Pennyfoot Country Club to get ready for the Christmas celebration. Phoebe is once again in a dither putting together yet another skit to present at the annual Christmas show. In addition, Phoebe and her husband, Col. Fortescue find the body of Gerald Evans on the beach near the hotel. They soon fined that he was in fact a guest at Pennyfoot and also a detective who was investigating art thefts and the shipping of those items out of England. Although Cecily, Baxter and the others upstairs, are entertaining and well developed, it's the staff down in the kitchen that I have enjoyed so much. Mrs. Chubb the housekeeper, Gertie the head maid and all the other are an enjoyable group of people. They never fail to put a smile on my face and make me chuckle. This is the first of the Pennyfoot Hotel Mysteries I've read...and obviously number 22 in the series. I was just looking for another holiday cozy murder mystery at the bookstore and this one jumped out at me. One, I loved the whole Upstairs/Downstairs - Downton Abbey feel to it. I kind of envisioned Cecily as a Cora type woman. When the murder happened, I loved how her husband was like, 'ok, I know you're going to investigate this murder, so let's do it together'. And I loved how Cecily took it This is the first of the Pennyfoot Hotel Mysteries I've read...and obviously number 22 in the series. I was just looking for another holiday cozy murder mystery at the bookstore and this one jumped out at me. One, I loved the whole Upstairs/Downstairs - Downton Abbey feel to it. I kind of envisioned Cecily as a Cora type woman. When the murder happened, I loved how her husband was like, 'ok, I know you're going to investigate this murder, so let's do it together'. And I loved how Cecily took it upon herself to investigate and would snoop through the murder victims personal effects. My issue, and it could be because I stated with one of the last in the series, is all the characters felt the same at the beginning. I had a hard time keeping track of who was who and had to keep going back to the beginning to remember who they all were. I'm thinking if I had started with earlier in the series maybe this would not have been an issue. Sadly this is the last book in the Pennyfoot Hotel Mystery series... and I'd actually rate it about a 3 1/2, but as you can't do 1/2 measures here, I gave it a 4 instead. Ms Kingsbury is typing up some of the loose ends of some of her characters, but still leaves some hanging... Yes, there is a murder, but the "gusto" that has been in the prior books of this series seems to be lacking; whether it's due to being the last book or something else, I can't say. If you've read the series, then you'll w Sadly this is the last book in the Pennyfoot Hotel Mystery series... and I'd actually rate it about a 3 1/2, but as you can't do 1/2 measures here, I gave it a 4 instead. Ms Kingsbury is typing up some of the loose ends of some of her characters, but still leaves some hanging... Yes, there is a murder, but the "gusto" that has been in the prior books of this series seems to be lacking; whether it's due to being the last book or something else, I can't say. If you've read the series, then you'll want to have this book to finish it off; but if you haven't read the series, this is not the book to read to start it off with.... there is too much that you'll need some point of reference for. As has been mentioned in other reviews, this is the last in the series. I've enjoyed the series, but I have to be honest and say it was probably time to draw to an end. I had been hoping Baxter again was more involved in the investigation and he was to some extent, but it could have been so much more like the old days. Even the story lines of the characters weren't completely fleshed out and finished, so I was a little disappointed in that as well. As usual, a pleasant enough read, but I don't th As has been mentioned in other reviews, this is the last in the series. I've enjoyed the series, but I have to be honest and say it was probably time to draw to an end. I had been hoping Baxter again was more involved in the investigation and he was to some extent, but it could have been so much more like the old days. Even the story lines of the characters weren't completely fleshed out and finished, so I was a little disappointed in that as well. This may be the best of the Pennyfoot Christmas mysteries. I'm sad that Kate Kingsbury says it's the final one. Even when they're middling, they are fun holiday reads. Ah well... maybe we'll still have some more books with Cecily and Baxter one of these days. The door was left open on that. Fingers crossed. I have one minor peeve with this installment in the long running series -- what about Daisy, the nanny to Gertie's twins? She doesn't show up once! I know she's a very minor character, but it This may be the best of the Pennyfoot Christmas mysteries. I'm sad that Kate Kingsbury says it's the final one. Even when they're middling, they are fun holiday reads. Ah well... maybe we'll still have some more books with Cecily and Baxter one of these days. The door was left open on that. Fingers crossed. It's once again Christmastime at The Pennyfoot Country Club. Cecily and everyone is hoping that this year will be different and that the Christmas curse will not rear its ugly head. But alas, the curse arrives with a vengeance, two bodies and several damaged housemaids later Cecily is on the track of art thieves with the help of her husband who, until recently, did not want to get involved. The reader will not be disappointed. This story moves a little faster than usual thus making it hard to put It's once again Christmastime at The Pennyfoot Country Club. Cecily and everyone is hoping that this year will be different and that the Christmas curse will not rear its ugly head. But alas, the curse arrives with a vengeance, two bodies and several damaged housemaids later Cecily is on the track of art thieves with the help of her husband who, until recently, did not want to get involved.